I skipped the 10th English Friday and I regret about it, huhu. I hope I'll never skip the challenge again. This week's challenge is very interesting for me. The theme is about Outfit Of The Day (OOTD). I didn't took a single photo today, so I'll post about my outfit last Saturday in this post. As a girl who wearing veil, I try to dress proper and modest. As a traveller, I don't want to bring too many clothes during my journey. The solution for both problems is a maxi dress. It would not take a big part in my baggage since it only consist of one piece of clothes, no need to mix and match with other clothes. I usually choose a dress made from cotton fabric since it will be comfortable whether the weather is hot or cold. -The veil is from Kaffah. I love the material, easy to wear and modified with our own style. 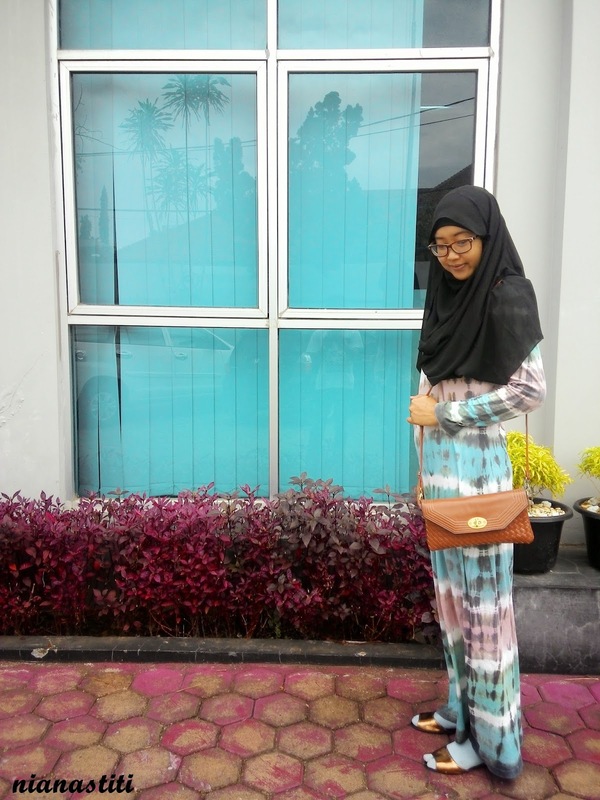 -Dress is from Dian Pelangi, I bought it at 2012, I already wear it several times since the fabric is very comfortable and the design is simply timeless. -Sling bag is from Les Femmes, my friends gave me for my birthday present this year. -The sandals is from The Little Thing She Needs, I bought last year. I think that kind of sandals is back on trend for now. -Don't forget to wear socks for more syar'i and to protect the foot skin from the hot weather. That's the story about my outfit. Do you interested with the topic? I think every girl would love a pretty dress and will be full of spirit to talk about it, hihi. Let's join the challenge! You can read about it here. dari dulu pingin punya tiedye (duh, gmne sih tulisannye? XD) tapi gak kebeli2 juga, kesalib sama kebutuhan yg laen #halah. Modest yet chic and very comfortable, right? Enggak semua cucok dgn tye dye, tapi dirimuu kereeen mbaaa. Mbak Nia...I like your outfit, so simple yet beautiful. By the way, where did you stand at the photo? Since I had lived in Padang for several years, I am curious about it.